SINGAPORE — Former bowler Marella Vania Salamat is a Southeast Asian Games gold medallist, thanks to her shift to another sport. Just two years after taking up competitive cycling, Salamat crowned herself as the SEA Games champion by ruling the women's individual time trial in impressive fashion at the Marina Bay. Salamat, only 21 and a Dentristry sophomore at University of the East, clocked 44 minutes and 46.38 seconds to rule the 30-km event raced over a relatively flat course, finishing more than a kilometer ahead of her closest rival. Thailand’s Chanpeng Nontasin, the 30-year-old time trial gold medal winner and mass start silver medalist in the 2011 edition of the Games, finished 45.96 seconds behind. Singapore Chan Siew Kheng, winner of the gold medal in 2013 in Myamar, was third 2:58.53 behind, reaching the finish line at a time when Salamat was already cooling down at the team’s tent. “Nagbunga ang lahat ng pinaghirapan ko,” said Salamat, who was lured to cycling by national coach Cesar Lobramonte one morning in 2013 when she was biking as part of her cross training at the Mall of Asia grounds with her bowling coaches Edward Coo and Orlyn Batistin. “Kasama na rin ang pagtitiwala sa sarili at sa extensive training naming sa Pilipinas,” added Salamat, the eldest in a brood of thee of engineer and competitive bowler Rodolfo and dentist Marivic Salamat. 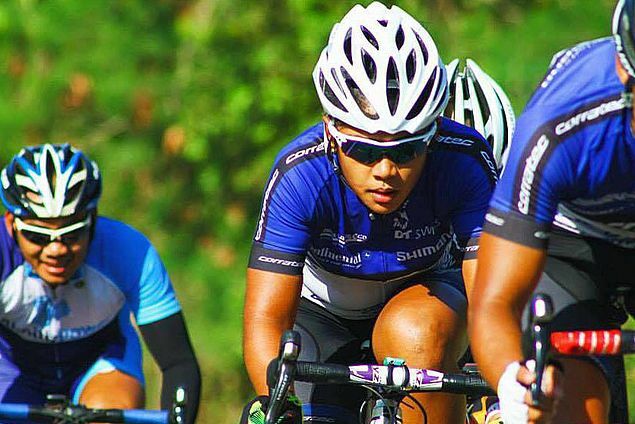 Salamat is no doubt a rising star in the cycling team. “She’s a very strong rider and if given the proper attention, she could go a long, long way,” national team head coach Chris Allison said of Salamat, who along with national teammate Avegail Rombaon, had to race against the men back home to hone for these Games. Salamat’s gold was only the second for the Philippines in a women's road race after Baby Marites Bitbit topped the mass start race in the 2007 Games in Nakhon Ratchasima. It was a different story for Mark John Lexer Galedo. Galedo failed to retain the men’s time trial gold medal and finished in sixth place, clocking 56:21.59 over the 40-km course. His teammate, Ronald Oranza, missed the podium with 56:00.34, some 21 seconds behind bronze medalist Trinh Duc Tam (55:39.20) of Vietnam. Indonesia’s Robin Manullang won gold in 53:55.41 and Thailand’s Turakit Boonratanathanakorn bagged silver in 54:47.57. The criterium races for men (10 am.) and women (9 a.m.) are scheduled on Friday in the same venue. Galedo and Oranza will be leading the men’s campaign with Jerry Aquino Jr., former Asian junior road race champion Rustom Lim, Jan Paul Morales and George Oconer Jr., son of national coach Bert Oconer. Salamat and Rombaon will race in the women’s division.